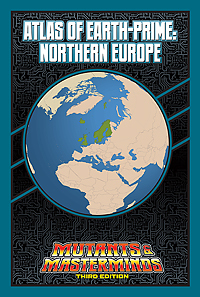 A land of harsh winters, dramatic landscape, and ancient magics, Northern Europe is also home to some of the most advanced scientific organizations in the world. The region’s diversity has caused it to become a hotbed of superheroic—and supervillainous—activity. Ancient mysticism and modern technology collide, while heroes like Britannia and MacRoth take on threats like Manteis and the monstrous Iku-Turso.